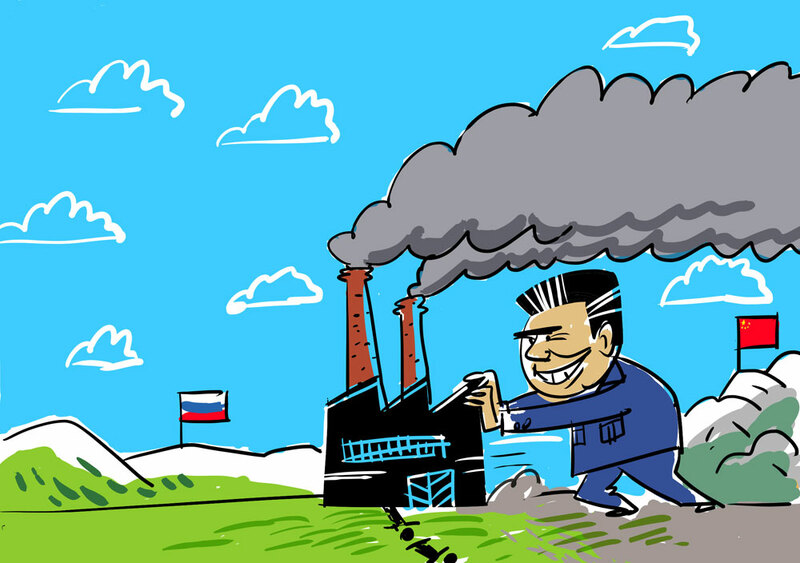 Environmentalists have expressed concern over a move to relocate Chinese factories to the Russian Far East. Experts from WWF’s Amur branch assess the environmental impact of moving certain Chinese industries to Russia’s highly forested peripheral eastern region. China’s proposal to relocate some of its production facilities to the Russian Far East has provoked heated debates among many experts. The proponents argue that the new investments will boost trans-border cooperation and generate many economic benefits in Russia’s peripheral eastern region. Skeptics claim that environmental costs would outweigh the benefits given the fact that the industries selected for relocation would include “environmentally dirty” metallurgy, cement production and chemical plants particularly damaging for the biodiversity rich region, which is defined by pristine freshwater ecosystems and intact forest landscapes. The optimism of the ministry’s officials is not shared by environmentalists. Russia’s environmental laws were weakened throughout the 2000s. For example, the requirement for projects to undergo state environmental expertise/expert review was repealed with the exception of those projects planned within protected areas and on the continental shelf. In addition, the implementation of new environmental laws, including on the adoption of best available technologies (BAT), will come into effect only in 2018. This could be postponed if there is pressure from the big industrial lobby. Moreover, Russia’s territories of accelerated developments (TADs) in the Far East, the recipients of these new Chinese investments, are made exempt from many environmental regulations. As for China, environmental problems have reached an epic scale. Air pollution, soil erosion and fresh water shortages are common. The environmental burden of disease is so significant that it is proven to reduce the lifespan of people in China. Spontaneous environmental protests are increasing across the entire country. The authorities can no longer afford to ignore the issue. Last year, the government adopted a new program, titled ‘The Integrated Reform for Ecological Progress,’ which was scheduled for the thirteenth 5-year plan commencing this year. To clean up the environment, China’s economy will go through a green shift: embracing new and green technologies, restructuring in favor of knowledge-based sectors and manufacturing of high added-value products. In addition, the Chinese government has taken new and bold international climate change obligations, to reduce C02 emission intensity by 60-65 per cent by 2030, which will imply the reduction in industrial pollution and energy production based on coal. Is it possible to pursue all these goals simultaneously while not jeopardizing economic growth? It is worth noting that the West went through its own “green shift” in the past, by relocating polluting manufacturing facilities to underdeveloped countries including China and India. China may decide to follow suit. Despite boosting its investments practically in all corners of the globe, China’s investment level in the Russian Far East, the region of immediate proximity, has remained insignificant and mostly limited to natural resources and agricultural sectors. In 2005, the government of Heilongjiang, China’s province in the northeast, declared a war on gold dredging in its natural forests as too damaging for forest and wetland ecosystems. A few years later there was almost no gold dredging in the province. Some Chinese enterprises decided to relocate to the Russian Far East where authorities relaxed environmental impact assessment and reduced fines for environmental damage. In Russia’s forest sector, China’s investments went to opening new primitive sawmills, to produce rough-sawn lumber and to export it to Chinese provinces, to manufacture furniture and flooring materials. It was well-documented that these sawmills were used as purchasing sites for valuable timber illegally logged in the last remaining hardwood forests in Russian Far East. After China decided to implement a logging ban in its natural forests, the logging pressure on biodiversity-rich forests in the Primorye and Khabarovsk territories increased once again. The Russian Far East is very rich in natural capital: rare species, intact forests, rich minerals, pristine freshwater ecosystems and unpolluted soil. A long-term strategic vision should prevent ruining this region, which is located in the periphery of the Asia-Pacific’s major economies. It should not become the hub for “technology transfer” of outdated production and dirty manufacturing facilities from societies moving up in the global production value chain. - Speed up the adoption of a draft law improving procedures on the state environmental expert review and environmental impact assessment. Thise draft calls for meaningful and wide stakeholder consultations including with local populations impacted by a proposed project. - By 2017, finalize all necessary regulatory requirements for the new law on the best available technologies (BAT) and standards to come into force. - Government banks and Russia-China investment funds with government investments should use, in their assessments, relevant projects for investment, the criteria of the best available technologies and best sectorial indicators for energy efficiency, discharges and for pollution levels. - The information from the environmental impact assessment should be made available in the Russian language and placed on the web-sites of a company proposing the assessed project and of an investment agency(ies) funding it. The meaningful realization of these steps will reduce many (but not all) risks of relocating Chinese manufacturing facilities to Russian Far East. The authors work for WWF Russia. Views expressed in this article are personal and may not necessarily reflect those of RBTH.